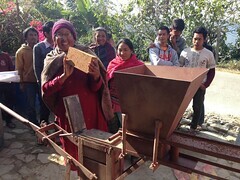 CLN and local non-profit partner Society Development Center (SODEC) began the Organic Almond Project 4 years ago to help people in one of the poorest areas of Nepal, where life has been brutally challenging for centuries. The land isn’t suitable for traditional food crops, so families regularly suffer from malnutrition because they cannot grow enough food for the whole year. Over 60% of young children are malnourished. With no way to make money locally, able-bodied men will work the agricultural season and then leave after the harvest to work in India for 3-4 months in construction or mining in order to earn cash. 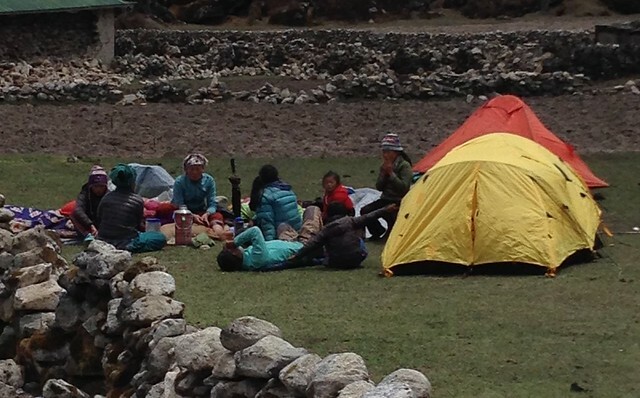 They sleep outdoors, under tarps, engage in heavy labor, and bring home perhaps $70-$100 total for their efforts—the only cash the family will see all year. Farmer Khadga Bahadur Oli proudly shows off his flowering 3-year-old almond tree to SODEC field staff Ghanashyam GC (left) who is visiting to discuss soil and plant management. Our goal was to initiate an organic cash-crop industry that could produce income as well as supplement the local diet. SODEC built on their learning from our joint tea program and looked for a crop that was low-maintenance, had a high selling price, and was in high demand within Nepal. Almonds also store well for months and have good nutritional value. The challenge was that no one had ever grown commercial almonds in Nepal…and many people thought it couldn’t be done due to the rainfall cycles. 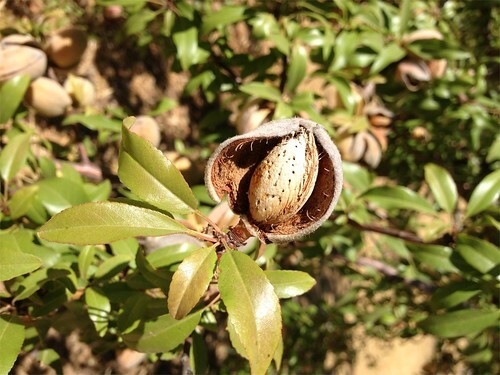 Director Parshu Dahal and the team of SODEC drew on technical agricultural research conducted by an INGO, on local knowledge at an expat-owned plant nursery near Kathmandu, and on their grassroots organizing skills to prove the viability of almonds. Through the past 4 years, we have planted over 1200 trees as well as trained and subsidized 62 farmers in the program. Farmers have learned how to care properly for the trees and graft healthier saplings, bringing sapling survival up from 50% to 90%. We have installed rainwater barrels and cisterns to collect water that is used during the dry season to keep the trees healthy, and we have created a local sapling nursery. 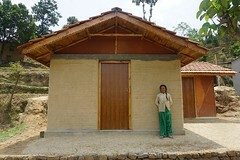 The nursery marks a major turning point in the program’s success: saplings from Kathmandu are expensive, do not transport well, and have a high mortality rate. By training local farmers in grafting techniques, we will now produce saplings locally—making them more affordable and more likely to survive being transplanted. The high cost and low survival of the saplings was a barrier for farmer participation, but with 2500 saplings being grafted in the nursery this year, we have strong local interest and many more farmers ready to plant when the saplings are ready next year. Farmer Tek Bahadur (red hat) grows wheat and corn as the primary food for his family. He has heard about almonds and is excited to try growing them, initially planting only 10 trees. Other farmers came to help him and learn the process of almond planting and have planted 2 trees each to test them out. At the same time, we have demonstrated that almonds can be grown in Nepal. 60% of our existing trees are already flowering! Some varieties flower quickly while others take an extra year or two to begin flowering (but have higher yields and/or tastier nuts). We expect that all of the trees will be flowering in the next two years. Of the trees that are flowering, about half have good production of nuts (and that number will improve as the trees mature). Almonds in Nepal will probably never have the high yields that we see in commercial U.S. production…but they don’t need to. One tree with good production will net a farmer about $12 this year and more in the future as the trees mature to full production. $12 may not sound like much, but if you multiply it times 10 trees, it’s more than what a family member would earn from 3-4 months of harsh labor in India. It’s a very substantial cash earner for these families, and farmers are ready to begin planting more trees! Now local government agricultural programs as well as NGO’s are interested to potentially support the program. Part of this year’s goals (in addition to grafting 2500 almond saplings) is to organize the farmers into cooperatives that are registered with the government so that they can access local agricultural support funds. SODEC Director Parshu Dahal also plans to write a grant on behalf of the cooperative to tap other international funding. With demonstrated success, outside organizations have shown up for field visits and been impressed with the progress and the possibilities. CLN organic agriculture grants over the past 8 years have directly created the opportunity for more than 250 rural farming families to generate income that will be increasing over time–and have indirectly supported hundreds more. Almond farming will provide essential economic support for this community and will create stability for education, nutrition, housing, and other basic needs. We are moving towards immediate income generation, relief from malnutrition, and long-term sustainability both through other donors and through a viable economic model as the program grows! Donations of $3000 are needed so that CLN and SODEC can facilitate the cooperatives, ensure successful expansion of the plantations and nurseries, and collaborate with interested government and non-profit agencies to get them involved with the program long-term for sustainability. SODEC Director Parshu Dahal examines the condition of almond sapling roots in Kathmandu before transporting them a day’s drive west to the work area. Transporting saplings from Kathmandu has been expensive, and many plants do not survive – we are starting our own nursery this year! The proof is in the bag! Some almonds from the first flowering of our trees this year. 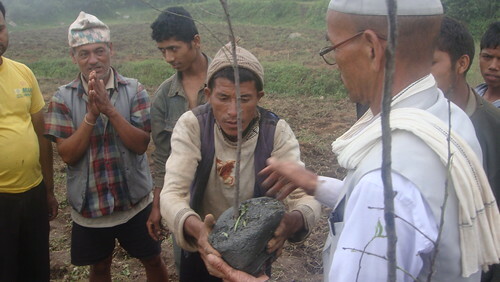 Farmer Khadga Bahadur Oli, along with his wife and a neighbor woman, are learning about the planting of almond saplings from a SODEC facilitator (standing in the foreground). After our success with tea, we are now expanding our organic cash crop program to one of the poorest districts of Nepal, where the average life span is only 45 years (20 years below the national average for Nepal). In this region, people are malnourished throughout their lives, and a staggering 99% of young men have left to find work abroad (generally hard labor in Dubai, Malaysia, Qatar, and Saudi Arabia). With preliminary research and a technical agricultural partner in place, Parshu and our team at SODEC have planted 388 trees in 2013, some on our demonstration plot and some with farmers who are starting their own orchards. We need your help to get this program fully launched over the next 3 years, with an estimated cost of $33,000—our goal is to help over 200 families double, triple, even quadruple their income!